Best Chinese Knives: Higonokami Style Folder Review! So I just got back from a trip to China and had this one waiting for me for a review. Got this solely with a purpose to see how it is like and to make this review on it, because it is one of the most intriguing budget folders on Ali. The description about this knife states the handle is made from titanium+CF (which is amazing for the price). In addition, a lot of people are certain it is a friction folder and is legal to carry in countries where locking blades are prohibited. 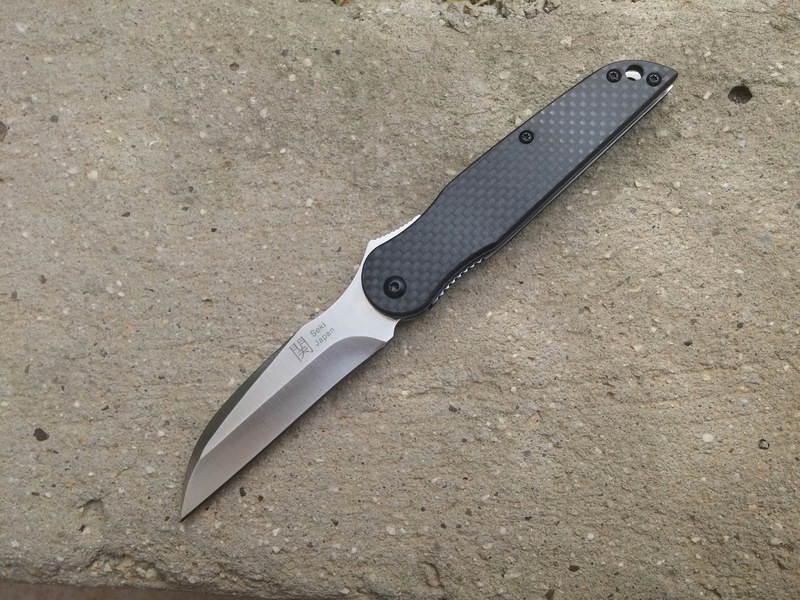 In fact, after I checked it - the handle is made from steel and a CF laminate, similar to the one that is used on Ganzo knives. It runs on nylon washers and has a linerlock. It also has an original design (at least I haven't seen any original knife that is similar to it) but resembles one of the most iconic knives out there - the Japanese Higonokami (can't be called a clone though). The knife arrived in a good quality cloth knife pouch, was sharp and pretty smooth out of the box. The blade is centered and supposedly made from D2 steel (might as well be 9Cr18MoV), the lockup is solid. No fit and finish problems out of the box. The blade has satin finish and markings - "Seki Japan" from one side (I suspect it has nothing to do with Japan) and D2 marking on the other side. Some people say they are able to flick it out like a front flipper with one hand, I am able to do so only if I hold the knife with the other hand. Nevertheless, the knife can be opened and closed easily and smoothly using only one hand in one continuous motion. Ergonomics are great, I am able to get a full 4 finger grip on this relatively small handle and it is even better if you position the thumb further on the blade. There are few sharp corners on the knife (around the opening trigger), but those could be easily buffed out. The knife has a lanyard hole, no pocket clip though. Summary - although it doesn't match the description, the knife is pretty well made, has original, gentleman style design to it and is worth it's price IMO. It can be carried as an EDC knife in a suit pocket or just thrown in the pocket. I have considered this knife a few times, but I always found something else instead. Lately, I have bought some more premium American knives (ZT, Benchmade, Bradford) as well as some better Chinese knives (Vespa, CH). I also received some Chinese knives that were falsely advertised. For now, I am sticking with the established vendors I already know, even if it costs me a little more. We each have our own path and choices, especially in the knife world and I respect each one. BTW - I knew the knife wasn't to the specs before ordering it, got it solely for a review and to find out for 100%. Nice find. I've been eyeing these for a while, too, there's even some with a pocket clip. Yeah, it really resembles the overall concept, but can't be called a clone imo. Cheers and again - thanks for your input! I guess you're right. Of course it doesn't help that on the seller's page they hide the logo which very much resembles to the Hikari one.Still I wouldn't call it a clone with no "real" logo on it and even if so I wouldn't care that much, I have some CRK copies/clones/hommages myself, too, some with, some without a logo (which I prefer, like on the Vespa Neon).